Some of China's millionaires have an unusual problem: They're having trouble giving their money away. Would-be donors have to navigate the country's fledgling non-profit sector, which suffers from a relative lack of trusted organizations, weak tax incentives and public concerns over transparency. Philanthropy is also a new idea in China. Traditional values emphasize an individual's responsibility to family, so pursuing riches only to donate them to outsiders strikes some as odd. 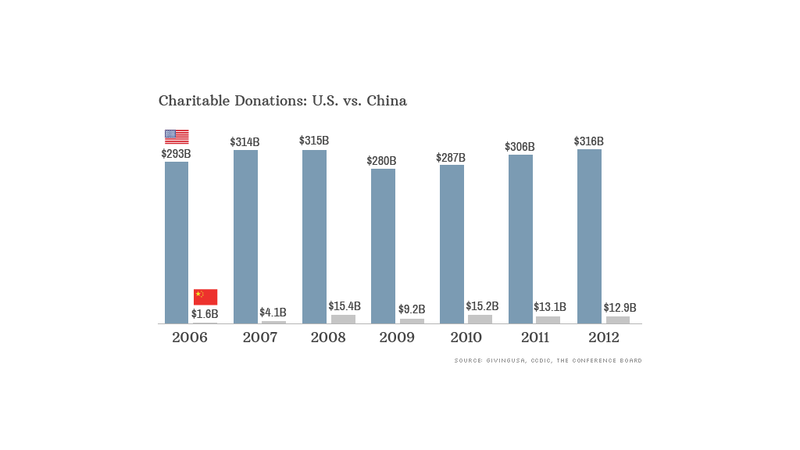 Chinese gave an estimated $13 billion to charity in 2012, compared to $316 billion in the U.S. The country has around half a million non-profits, whereas the U.S. has about 1.5 million. Anke Schrader, a China-based researcher at the Conference Board, said that China's position is not unusual for a developing country. While the U.S. has a long history of producing massively rich individuals, China didn't have a single billionaire just 10 years ago. "Overall, it's still in its very early stages," she said. "Entrepreneurs are shifting their thinking from what I would say is a pure consideration of pure wealth accumulation to thinking about wealth distribution." Advocates are hopeful that a decision by Alibaba co-founder Jack Ma will encourage other billionaires to open their wallets. In April, Ma partnered with Alibaba exec Joe Tsai to establish charitable trusts that could be worth more than $3 billion. "It will send a ripple effect through the community," said Dien Yuen, managing director of Kordant Philanthropy Advisors. "They're being proactive ... I think it will encourage more people to step up." But growth in charitable giving will also require the government to make substantial changes to the tax code, and loosen its grip on civil society. The central government has been at work for about a decade on a charity promotion law, but nothing official has materialized. The rules that do exist are thin, vague and sporadically enforced. Just setting up a non-profit or NGO can be exceedingly difficult. Charities are supposed to register with Beijing, and in many cases, submit to its control -- some of the biggest groups are joint partnerships with the government. The rules are opaque and applicants must complete a huge pile of paperwork. As a result, many decide to skirt the law. Yuen estimates that more than 1 million charities in China are unregistered. The lack of transparency can make it hard for donors to pick a legitimate group, and some choose to set up their own private foundations in an effort to avoid swindlers. Non-profits and donors also have to consider political circumstances -- advocating for free speech and human rights is off limits. More acceptable causes include the environment, rural education, poverty and support for migrant workers. Most charitable donations in China are made by corporations, which accounted for 58% of total donations in 2012, according to the Conference Board. Corporate donations outstrip individual gifts, Yuen said, partly because there aren't strong tax incentives to give to charity. While the government does offer some tax breaks for charitable donations, it can be difficult to claim the deduction. And since China doesn't have an inheritance tax, there isn't much impetus for the rich to reduce their heirs' tax bill by donating money. Numerous scandals in recent years have only added to the distrust of charities. One state-run group, the Red Cross Society of China, is still working to rebuild public confidence after a supposed employee was caught posting photos of herself with expensive cars and extravagant accessories. While China's Red Cross denied that the woman, Guo Meimei, was an employee, her posts led to widespread outrage in China and allegations of corruption. The incident had a lasting effect on the group, which has also been accused of misappropriating funds earmarked for disaster relief following the massive 2008 earthquake in Sichuan. "There was a huge backlash for years until this Jack Ma gift became public," said Yuen. "And suddenly, there is this whole positive movement again."